UPDATE: We have to work hard to clean & protect our land – in all kinds of weather! The forecast is rain but we will still be out there to beautify our Crocker Conservation Area. We hope you can join us at 10am. 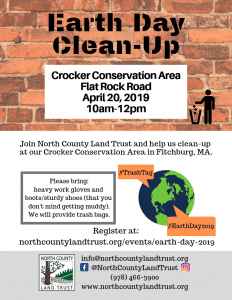 North County Land Trust is hosting an Earth Day Clean-Up at Crocker Conservation Area on April 20th from 10am-12pm. Join us to pick up litter and make the trails beautiful for spring! Please bring heavy work gloves and boots/sturdy shoes that you don’t mind getting muddy. We will bring the trash bags. Please register below so we know to expect you. I consent to my submitted data being collected and stored as outlined by North County Land Trust's Privacy and Cookies policy.